So do any providers (AIS, DTAC, True etc) actually still offer a one-year 4mbs unlimited package at a sensible price (sensible being 2500B/year max)? If so, is there a straightforward webpage that shows the package and/or the code needed to activate it? My True 4mbs package expires soon and I want to renew it or replace it. You would think that the providers would be falling over themselves to offer me these packages as I doubt that I actually used it more than one week in four over the entire year, and even then the usage per day was not excessive. I only really got it because of the convenience of being able to pay for a full year as a one-off and to not have to do endless tops-ups and reactivations, and I would like to do it again. All I seem to see on this subject in this forum these days are out of date offers and invitations to send/receive PMs. Don't forget to check CAT current prices too, they have a few yearly programs. 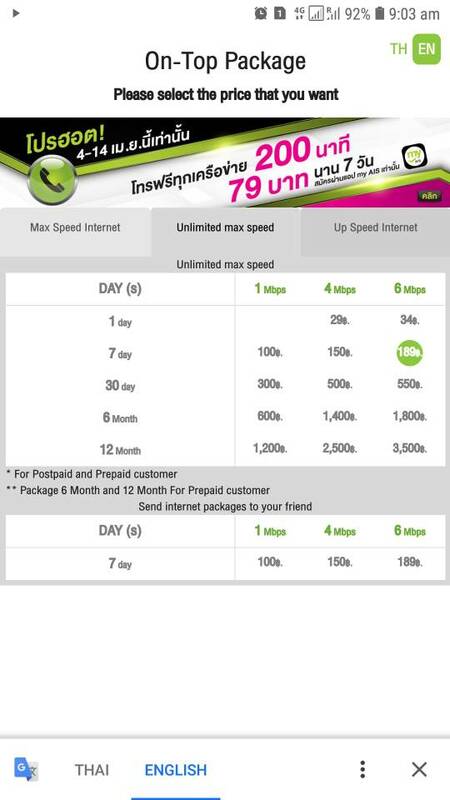 I have been using 1mbps for a year was 1200baht. Works well enough for email line app and facebook etc when not at home. Also serves as an emergency hotspot device always ready, been a goto twice this year as fires burned out lines near home. They had 4mbps also which was 2400 a year I think. I have always had great connection with them everywhere. If you had a phone with 2 Sims you could just have both true and AIS in there. I do have such a phone. Both slots are currently in use (Thai SIM + UK SIM). Don't forget to check CAT current prices too, they have a few yearly programs. I do hate companies that have a website with an "EN" button that just gives you the same Thai page. And as the prices and descriptions are images rather than text you cant even copy-paste them into Google translate. That deal that Scuba listed would suit me at just the 1 Mbps rather than 4 at just the 1200 Baht for a year seems a cracking deal. I currently use the True package one where its unlimited data (but not speed) for 1 month at 199 plus vat which when it throttles the speed still plays youtube normally. I know its a sight less than 1Mbps as well. Edge browser can have a added button up right to translate on demand page or a txt line …, can set to any language automatic too.. 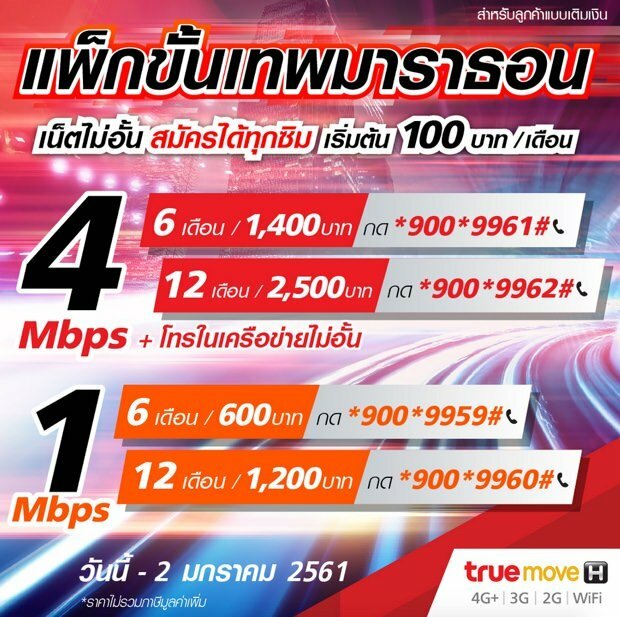 The Truemove H 12 month 1 Mbps for 1200 baht option used to be under *900*9960# but that was last year. No idea if the code is still valid, so I won't encourage you to top up 1200 to 1284 baht to see if it still works. *900*9959# for the 6 month 600 baht option. You won't get Scuba's package unless you have an AIS SIM registered before the 1st of Feb this year. Though MyCat is still open at the same price. Interestingly, I found an updated link from True; http://help.truecorp.co.th/truemoveh/16/3131?ln=en that indicates their price went up to 1800 baht, but even that date has expired. They have REALLY hiked their prices. I do also hate the sites all done in images, but it is easy way to code a page. If you don't mind a new sim you can buy one from Lazada, i have had mine about 5 months, works well and always 4mbps speed. Buy the Sim then activate it at True shop and thats that. Prices have gone up as I paid 1300 5 months ago. Where or how you you top up My CAT?